LONDON--(BUSINESS WIRE)--The global generic drugs market is expected to post a CAGR of more than 10% during the period 2018-2022, according to the latest market research report by Technavio. A key factor driving the growth of the market is the availability of low-cost alternatives. Generic drugs are available at a lower cost when compared with branded drugs as generic drug applicants do not have to repeat the animal and clinical studies that were required to demonstrate the safety and effectiveness of brand-name medicines. Generic drug companies do not have to incur high initial drug development costs. Thus, these drugs cost about 85% lesser than their brand-name equivalents. This market research report on the global generic drugs market 2018-2022 also provides an analysis of the most important trends expected to impact the market outlook during the forecast period. Technavio classifies an emerging trend as a major factor that has the potential to significantly impact the market and contribute to its growth or decline. The pharmaceutical companies have been using business process automation technologies such as RPA for R&D and manufacturing. RPA involves the use of software with artificial intelligence and machine learning capabilities to handle high-volume and repeatable tasks. RPA technology involves software that logs into applications, enters data, calculates and completes the necessary tasks, and logs out. “Several companies are using AI for pharmaceutical R&D and manufacturing as digital robots can perform high-volume and repeatable tasks. The speed at which such digital robots complete the processes involved in manufacturing will allow CROs to execute recurring processes faster. This will lead to increased efficiency,” says a senior analyst at Technavio for research on cardiovascular and metabolic disorders. This market research report segments the global generic drugs market by application (anti-infectives and CNS) and geography (APAC, EMEA, and the Americas). Anti-infectives are agents that act against infections either by inhibiting the spread of an infectious agent or by destroying the infectious agent. Anti-infective drugs are required to destroy infectious agents that cause several infections in the human body such as tuberculosis, sepsis, and smallpox. The Americas led the market in 2017 with close to 41% of the market share, followed by APAC and EMEA respectively. The Americas is expected to dominate the global market throughout the forecast period. 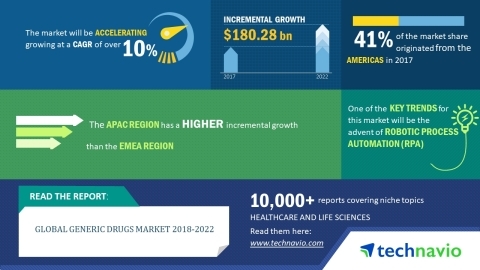 The global generic drugs market is expected to post a CAGR of more than 10% until 2022, according to the latest market research report by Technavio.